of Gay, Lesbian, Bisexual and Transgender History, Inc. 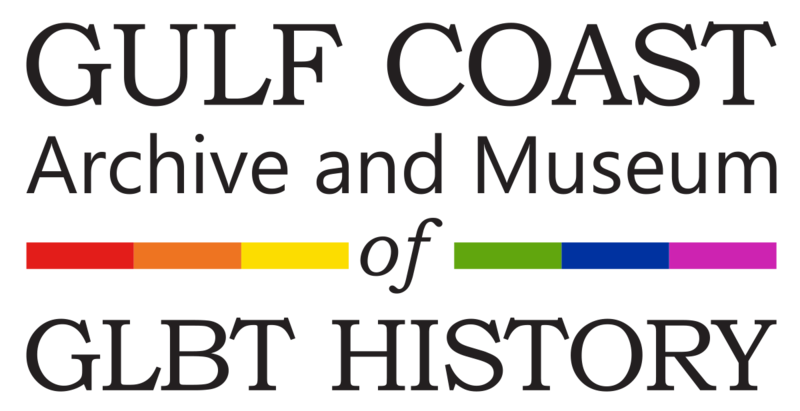 The Gulf Coast Archive and Museum of Gay, Lesbian, Bisexual & Transgender History, Inc. is a 501-c-3 organization that was formed in Houston, Texas, by a group of concerned activists so that our collective histories could be saved - as well as be available for educational uses - through the utilization of a museum or similar venue. Although we have had to close the museum space, our archives are still available by appointment. Appointments can be made for access to parts of the archives through Judy by calling 832-722-5785. Additionally, we do have a few satellite exhibits throughout the city and arrangements can be made for temporary ones for special functions. Our meetings are held the second Monday of each month at the warehouse, 6019 South Loop East (77033) at 7 p.m. Visitors are welcome. Montrose Voice and Other Archives Online! Through a partnership with the University of Houston, the first batch of the Montrose Voice is now available online at their website: http://digital.lib.uh.edu/collection/montrose. We are excited to be a part of this project and look forward to more and exciting things in our electronic future! In addition, there is now another archive Gulf Coast Archive and Museum (GCAM) Digital Archive which includes many other scanned items from the collections! We are looking for new members. Dues have been set at $25 annually, and will be necessary to vote in our regular meetings. To join, either go to our PayPal page and click on Join Now! or send us a check for $25 to GCAM, 5326 Dora St, Houston TX 77005. AND did you know that you can give GCAM a penny or so on every dollar you spend at Amazon? Click here. We are looking for people/groups who are interested in donating/loaning their collections to GCAM. Please let us know what you may have! If you are interested in learning more, feel free to join our mailing list at http://groups.yahoo.com/group/gcam/join. For more information, contact us! Want to know more about GCAM? We will attend your organizations meeting and do a short presentation for you. If you would like, we will bring a few items to show in order to give a better idea of what kinds of artifacts GCAM has collected. For more information or to schedule an Outreach date contact Craig or Judy or call 832-722-5785 between 11am and 11pm. 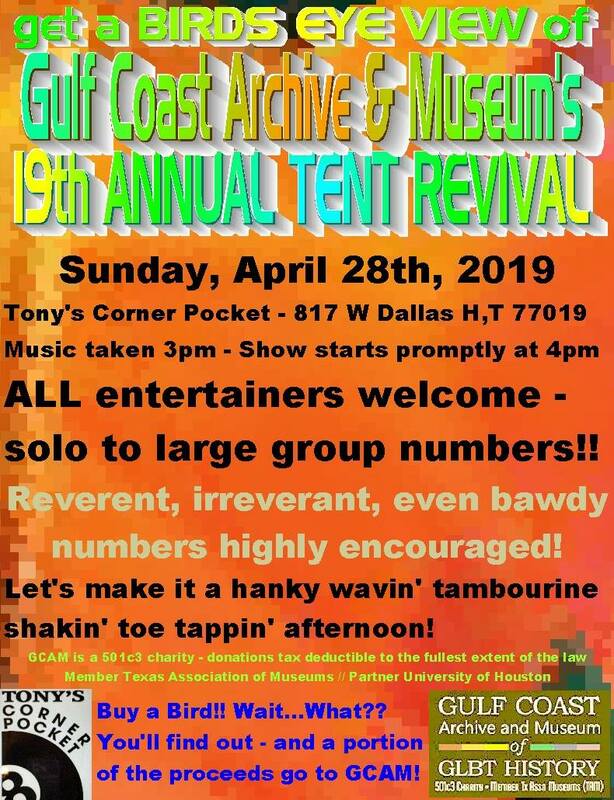 and that copyright is held by Gulf Coast Archive & Museum of Gay, Lesbian, Bixsexual and Transgender History, Inc. unless otherwise indicated. One should also assume that any content in our archives has a copyright of its own. For more information, e-mail GCAM. Your webmaster is Bruce Reeves. Our thanks to myhosting.com for hosting our site.